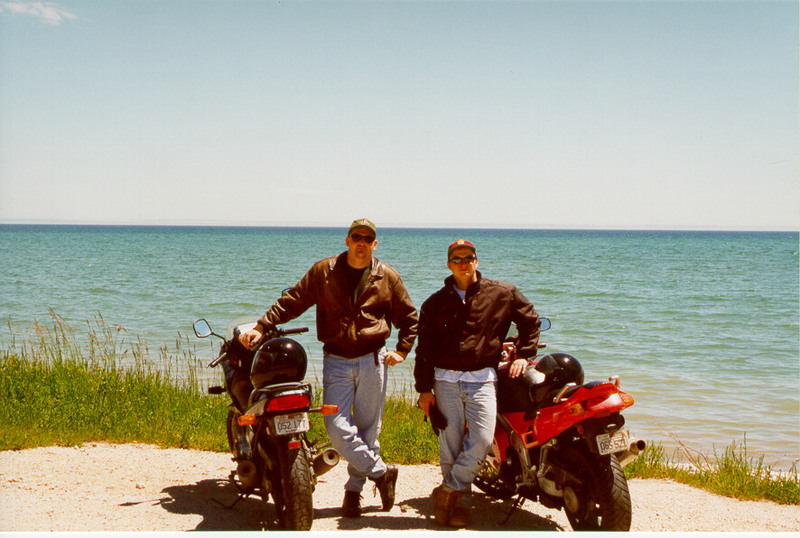 One day in 1997, Jeff Gary and Tad Gralewski decided to venture out into the unknown and take a motorcycle trip. A concept like this was foreign both to them and to others who heard about this undertaking. Many questioned the sanity of such a trip. Undeterred by these nay-sayers, out came the maps, and down went the beer. It was decided that these two brave souls would venture out and trace the outlines of Lake Michigan and Lake Superior. Armed with little more than their bikes, overstuffed luggage, and a yearning to find out what motorcycle travel was all about, they set out on what at the surface appeared to be a five-day trip. In reality, it ended up being a life-changing experience. Just hours into the trip, each of them started to realize that they stumbled on to something great. No longer were they sitting in front of computers running with the other rats in the maze - they were living life to its fullest. All that mattered was where the road took them. Along the way, they came across some great places - both physically and mentally. The sheer beauty of the countryside through which they rode was more than they had imagined, and it was not long before they realized that seeing places like this on two-wheels does make a difference. They were part of the experience, the road was beneath them, and the trees were a blanket keeping all of lifes troubles hundreds of miles away. Before they knew it, they were catapulted to a state of clarity, happiness, and peace. As the trip ended, they realized that the journey had only just begun. Their eyes were opened to a world where one is free to experience things the way that few others can imagine. Those who have done this know exactly what they found. They took other trips, but always look back on this trip as the true beginning of it all, and nothing but the fondest of memories fill their minds. The Around the Lakes ride has become somewhat of a yearly tradition, and Memorial Day weekend is becoming the default weekend for this journey to take place. Over the years, they have re-traced their original path many times, and always with others at their side to share in the experience. Some have repeated the trip with them a second time, others have not, but all have enjoyed the time on the road. Below are links to Tad Gralewski's trip reports from past years. This is just one interpretation of the trip, but should give you a general idea of the ride, the stories, and the possibilities that exist. Each year more and more people want to join in for the journey after hearing stories of past trips. We welcome everyone with open arms, and we hope that a trip like this will bring you everything that motorcycling has brought us and more. Even if you catch just a glimpse about what we speak, you'll understand now why you came this way. After all, isn't it your turn to find out what's out there?